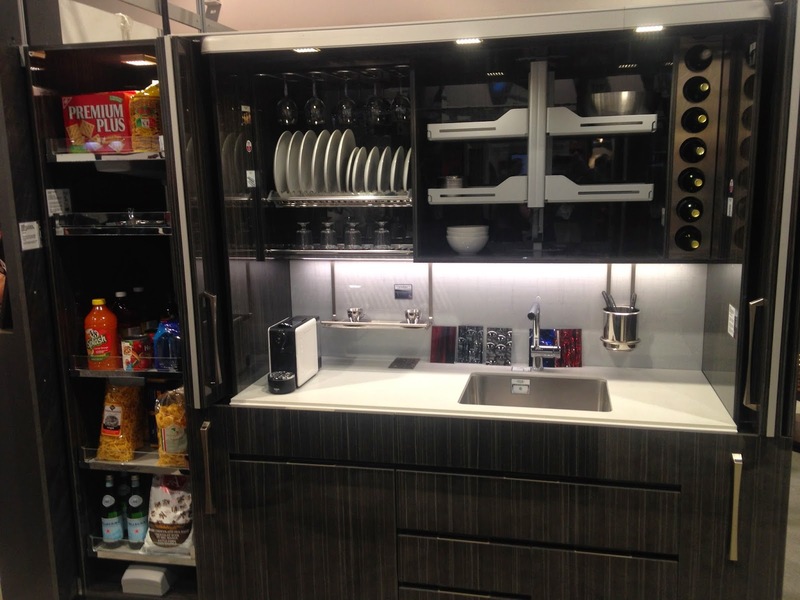 The coolest compact kitchen ever designed! 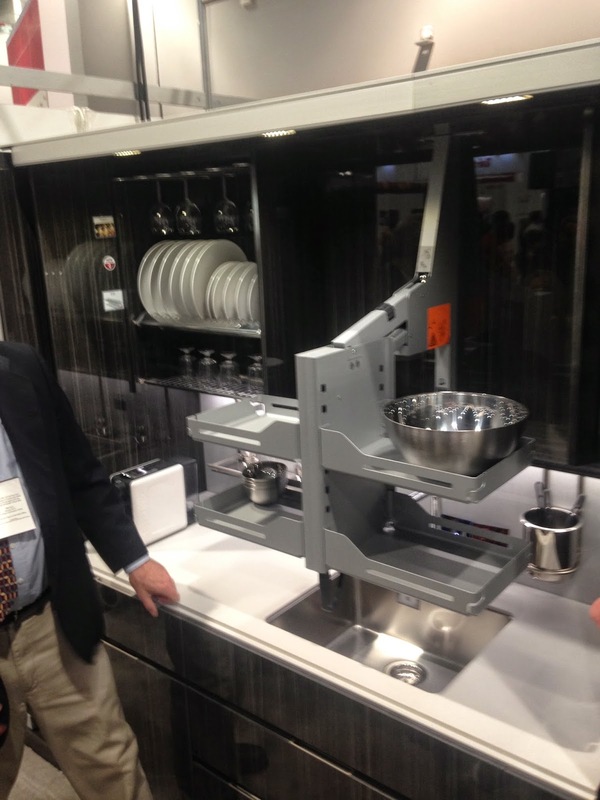 This is the best designed kitchenette I have ever seen. utilizing the newest in storage and design ideas, you can have an almost full kitchen in a 8' long wall, minus refrigerator and stove. the amount of storage and usability packed into this wall unit is unreal. This is perfect for an efficiency unit where space is a a premium. With the doors closed, the kitchen is totally hidden away from your guests, allowing full use of the space in front of the cabinets as well as presenting a very neat look in the living space. Once the doors start to open is when this unit shows off its true capacity. The central area contains your sink and workspace. with a large amount of counter space for its size. having storage space for everything you need allows the counter to be used for preparing food instead of storing all your kitchen tools. I love the task lighting and accent lighting in the shelf units that makes working in the space very easy. The well thought out design has a place for everything, even the wine! Dishes and glasses are neatly stored with easy access, and the accessory holders on the backsplash help keep the area clear. I would like working in this compact area. I think it feels much larger than it is. For the heavier items that you might not be comfortable stretching up high to store, the cabinet above the sink has a great pull down rack that lets you safely store the heavier items and self retracts back into the cabinet to tuck them away. No more climbing on precarious stools to reach the top shelves. The bottom unit has just as many surprises in store as the top. there are well lit storage shelves for cleaning supplies, a special compost bin, a large drawer and two trash bins with a special feature! The trash cans as seen to the left of the photo below are open topped so its easy to add trash or recyclables to them. My first question was "who wants stinky trash stored in your cabinet? ", well they thought of that too, as the drawer closes the bins are covered by a lid that automatically seals the bins, keeping them airtight and the smells contained. The same goes for the compost drawer below the sink. The tall pantry closet to the left pulls out allowing three sided access to each self in the cabinet. This allows for tons of accessible storage with nothing getting pushed to the unreachable black hole in the back of the cabinet. Each shelf is completely adjustable in seconds to the desired height with one handed operation, making this cabinet customizable for any storage. If you were wondering what the last two inches of this cabinet might contained, you will be happy to know that it has not been wasted. 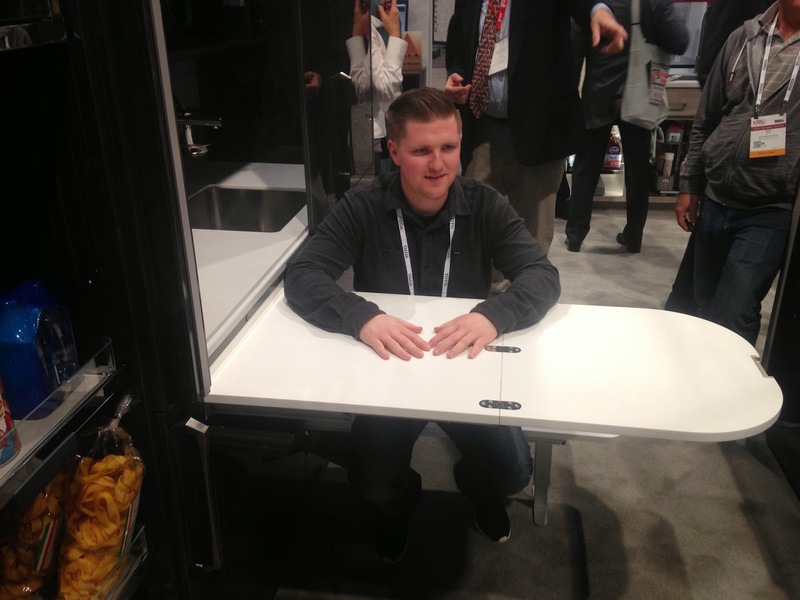 It contains a pull out table that can seat 2 people easily. It slides out then folds open into a bench seat and table top that is quite sturdy and spacious considering that it appears almost out of nowhere. 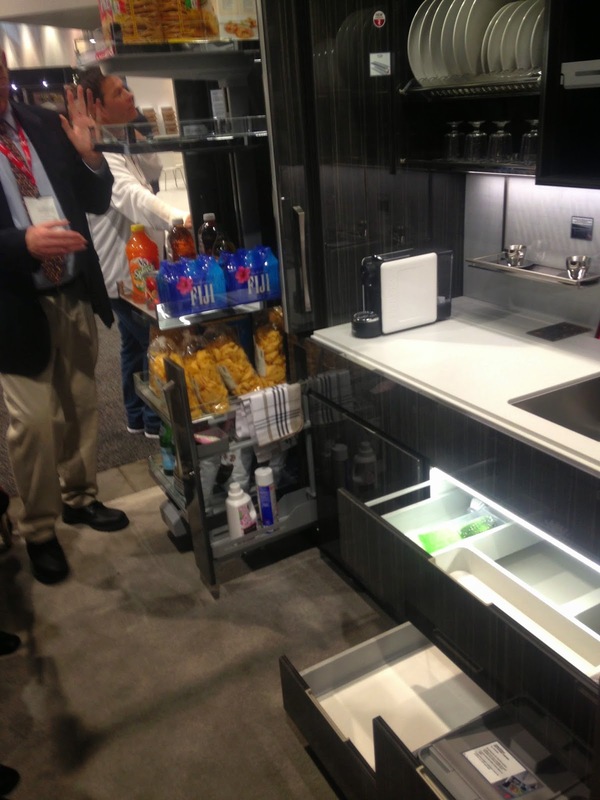 I was impressed, considering I had looked at this unit 5 minutes before and thought it was just a glorified wet bar. it is very well thought out and designed for actual daily use. I was very impressed by the amount of thought and good design that went into this unit. It really seemed to be almost futuristic to me in its use of space. It was very well done. 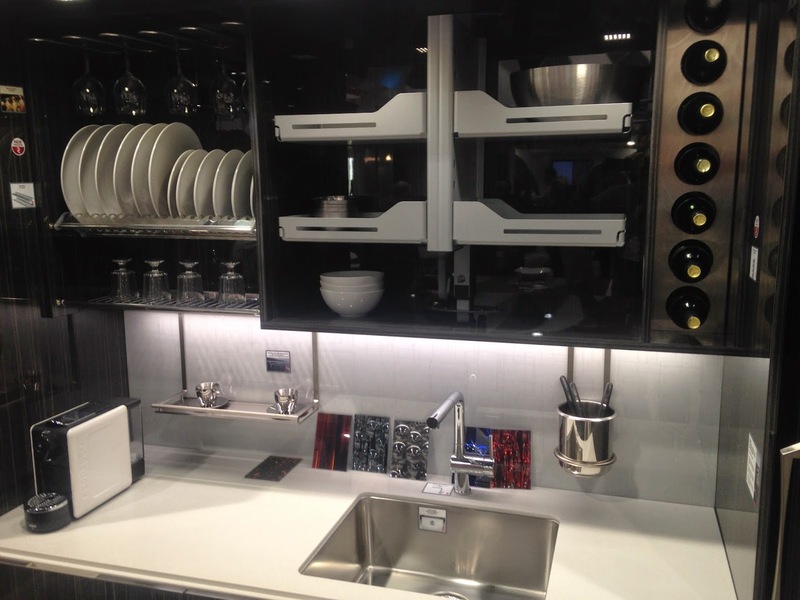 A point not to be missed is that this is a model to demonstrate the new trend in making your kitchen space more usable. All of these great ideas can be used in your kitchen individually, to improve your existing space. I think many people will like being able to add features to their kitchen without having to completely remodel their home. As I write this I have the master catalog from Rev-A-Shelf sitting on my desk, loaded with hundreds of great ideas to improve kitchens and bathrooms. I can't wait to start using them!! If you are interested in any more ideas for the kitchen, please don't hesitate to contact me, I love to create and install great ideas to make your kitchen amazing! 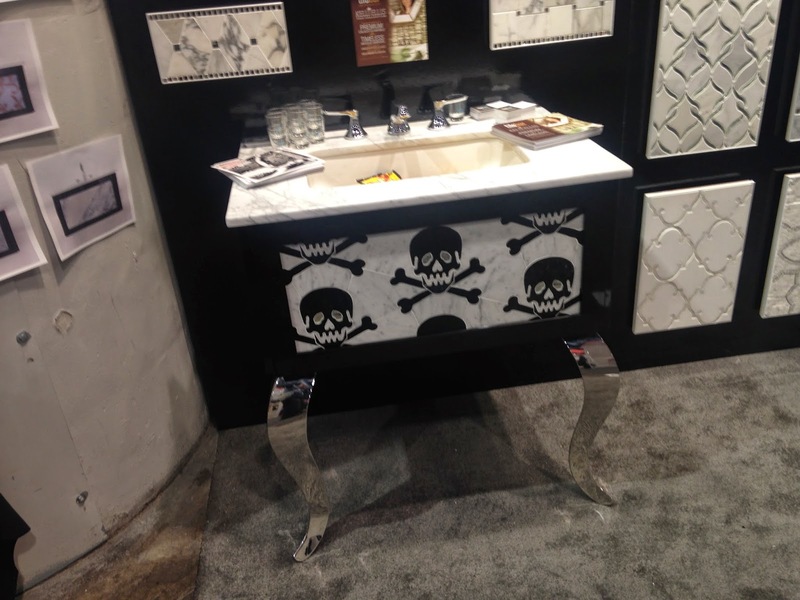 Skull and Crossbones, a new designer trend? What do you think? Las Vegas is known for strange goings on... You can get married by Elvis in any number of ways, you can't walk 50 yards on the strip without seeing some sort of memorable character and you can find any kind of food under the sun. Vegas has also been known for its over the top design, evidenced by a number of hotels and casinos on the strip. 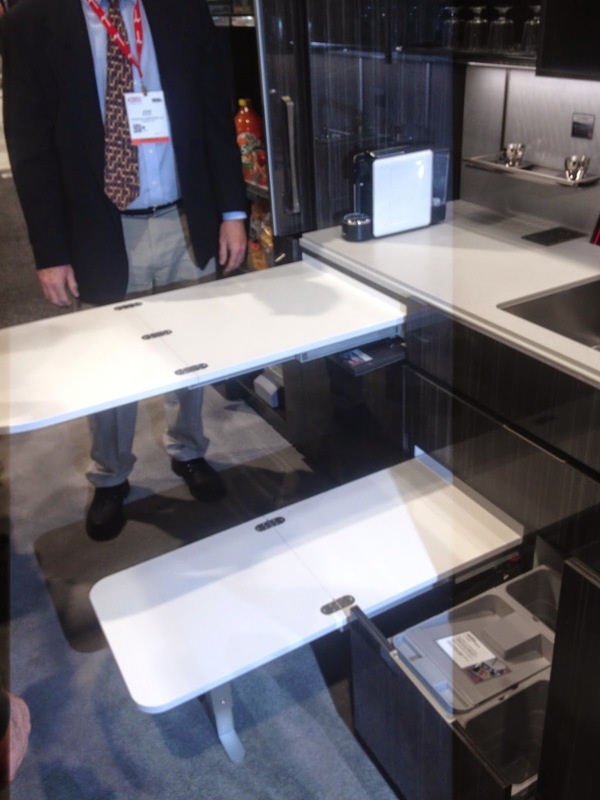 This one bathroom sink at the builders show this week really followed through with that theme. The chrome legs and skull and crossbones motif on the front goes to show that you can find something for everyone in Las Vegas. I think this vanity set is very cool and would make for a spectacular centerpiece in a bathroom. I imagine it would wipe that scowl right off a pirates face. Its the perfect piece to cheer up that Pirate in your life! 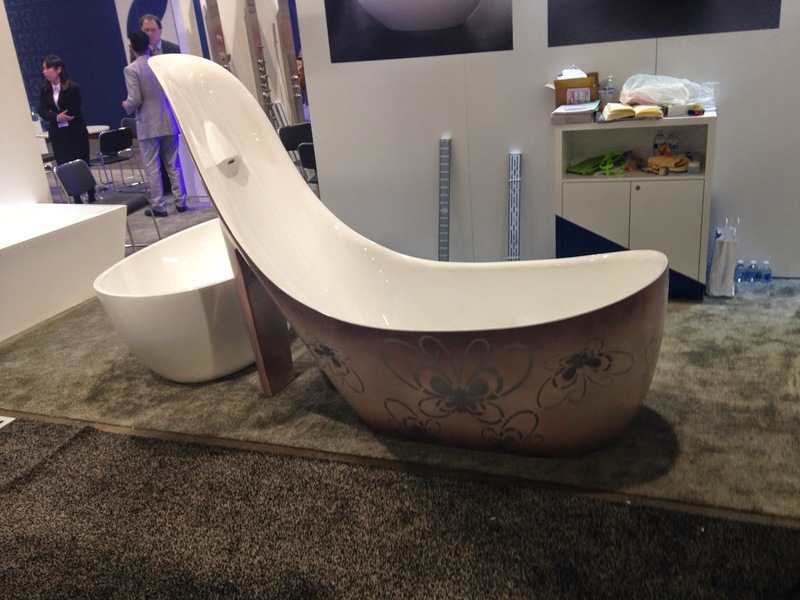 The Builders show never disappoints with tubs! This is a small collection of the soaking tubs I saw on display. 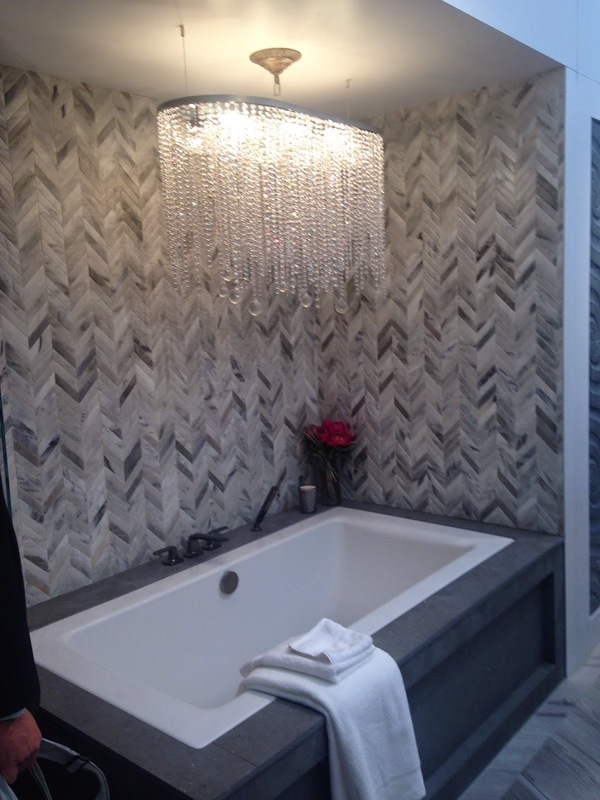 The International Builders Show 2015 has the best collection of soaking and jetted tubs on display. From inset tubs to free standing pieces of art. If you are looking to remodel your bath you need to take a look at these. The new style seems to be moving away from those monster tubs that take up half of your bathroom and transitioning to more space conscious designs that don't compromise in look. The new tubs can be still be a centerpiece in your bath, complimenting a built in tile shower rather than dominating it. 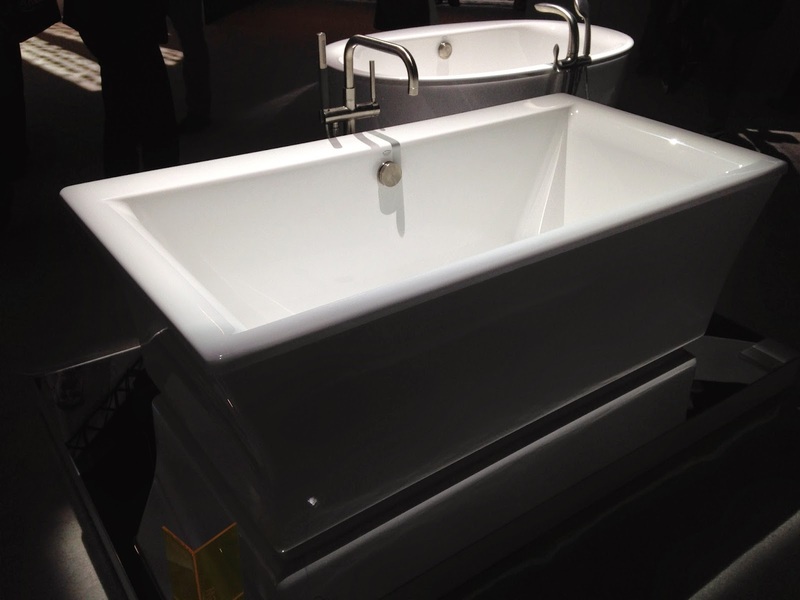 This First tub is from Kohler's Kallista Line of tubs. I love how it tucks right in to the corner of the bathroom and can still be the centerpiece. A really nice feature that I haven't seen before is that the edge of the tub is flush with the tile surround, creating a seamless look between the tile and tub. 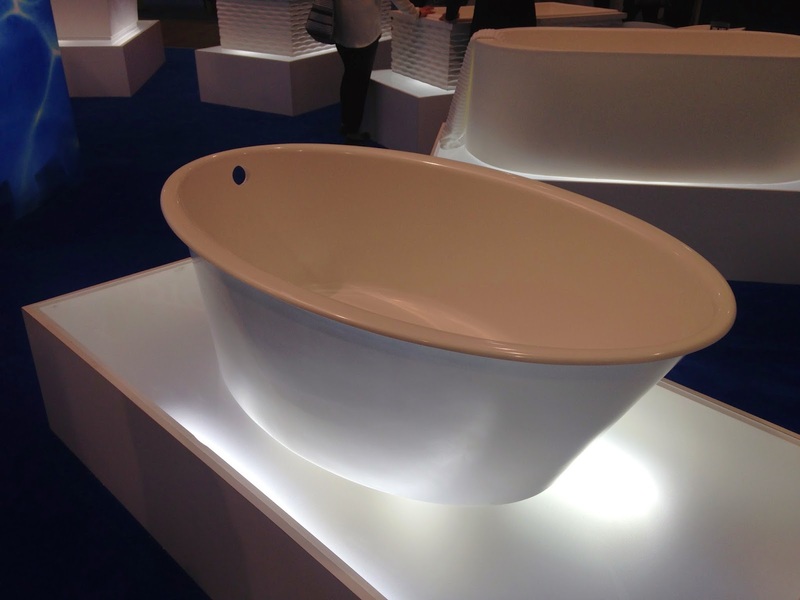 This is another of Kohler's Jetted tubs. 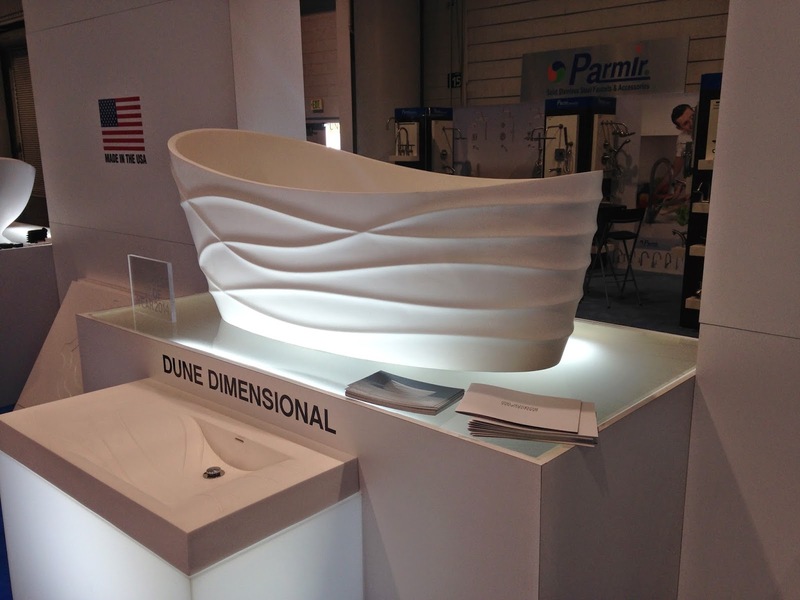 I love the curving lines on this free-standing tub when combined with the rectangular top edge. It looks super inviting! The rectangular lines of this next tub from Kohler will be sure to fit in great with a more modern style, it is a beautiful free-standing soaking tub that will hold two easily. 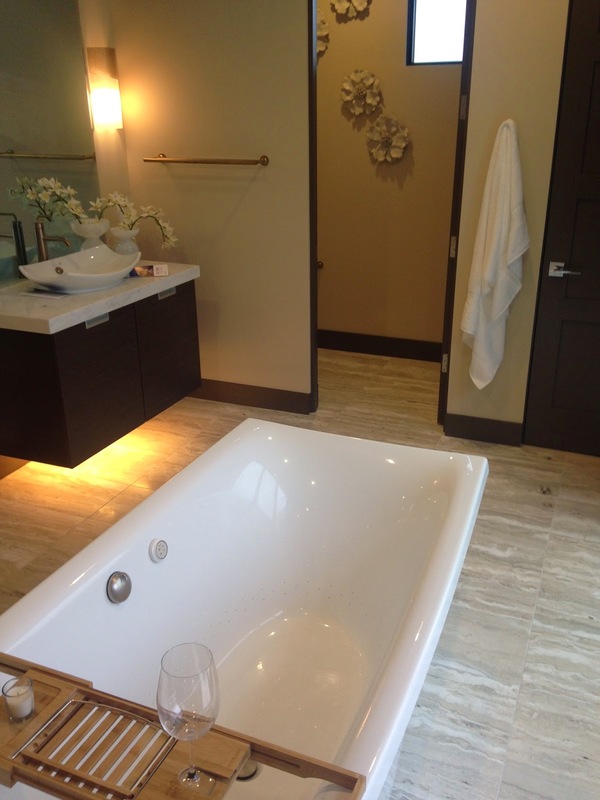 The tub shown in the bathroom below is from the New American Home. 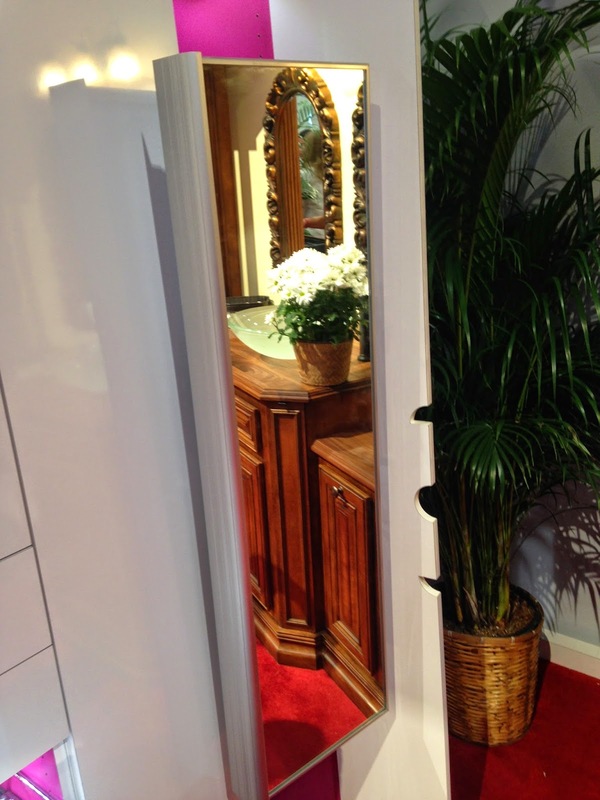 Its a nice freestanding unit that makes a perfect centerpiece to a showplace bathroom. What I really love is the shelf added to it to hold your glass of wine and whatever else you need for your bath. Of course if you like to make a little more of an impression, you can always order this high heel shoe style tub. pretty impressive! 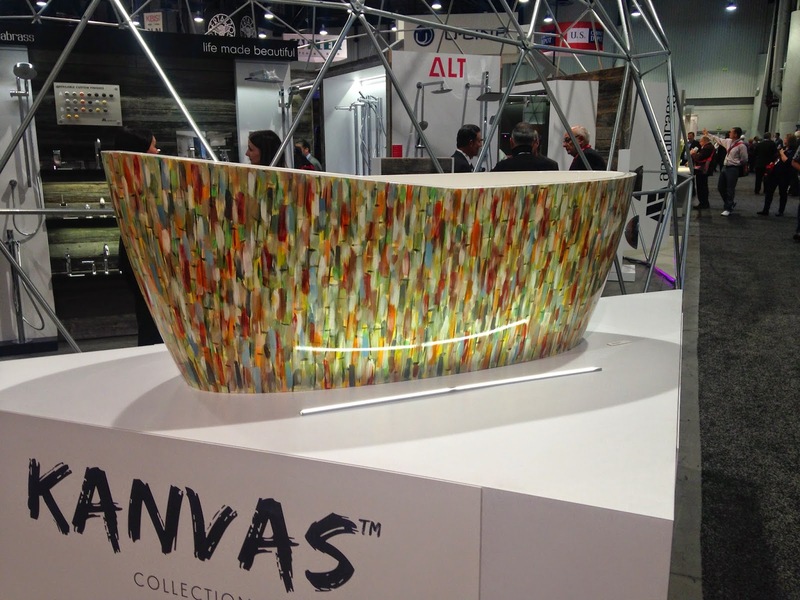 If you prefer a free standing tub that looks like a piece of art, the next few tubs might be right up your alley. 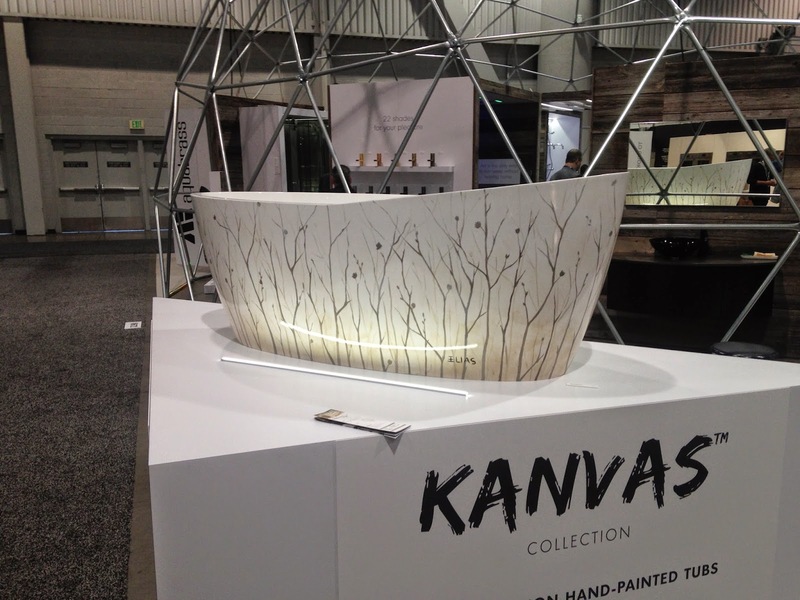 You can now get sculptured tubs, as well as hand painted designs on free standing tubs. If you are remodeling your bathroom, don't overlook all the great new options in tubs. Tubs are becoming a way to add a lot of style to your bathroom, from a classic rich look, to a modern fun piece of art in your bathroom. Add one of these cool tubs and your bathroom will become the favorite room in the house! 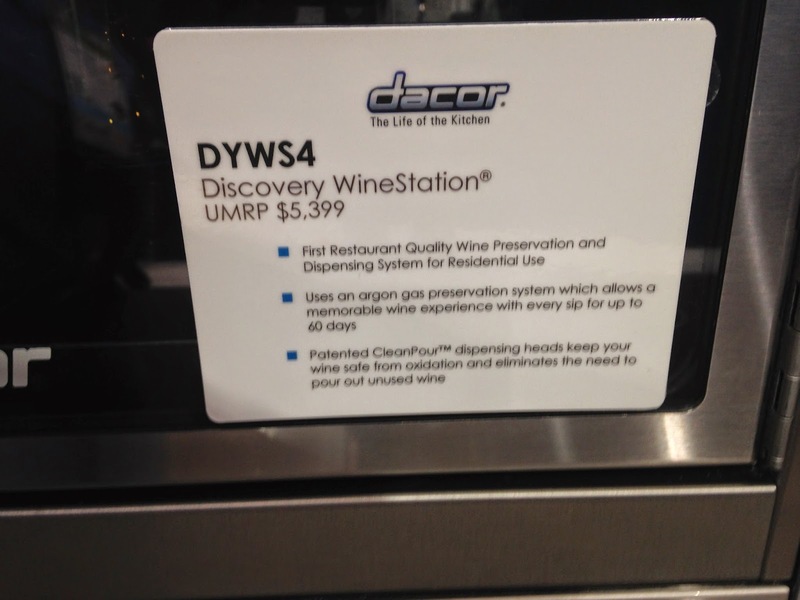 For those who believe wine is critical to survival, here is the ultimate wine station to put in your home. 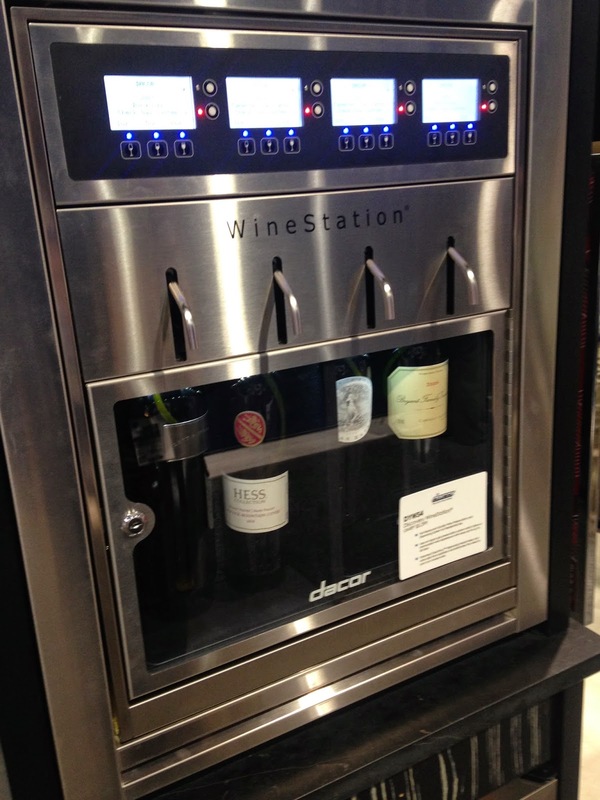 It's the coolest new innovation in wine storage! It keeps the wine in a perfect state of preservation for up to 60 days, maintaining it at the perfect temperature and ready for use at all times. 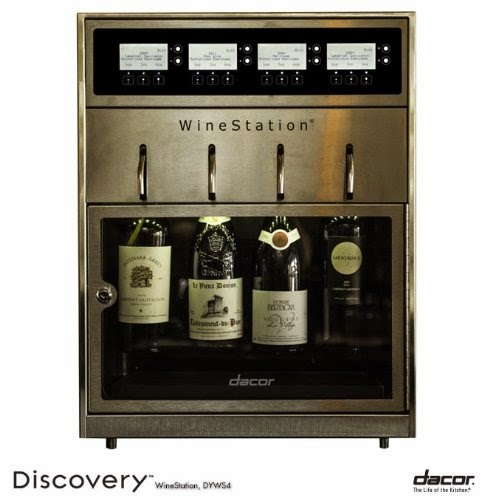 Impress your friends with the ultra modern Discovery WineStation, and never have to throw out unused wine again! Of course when your friends start to play with it, you will be going through a whole bunch more wine! Could this be the best crafting center ever? 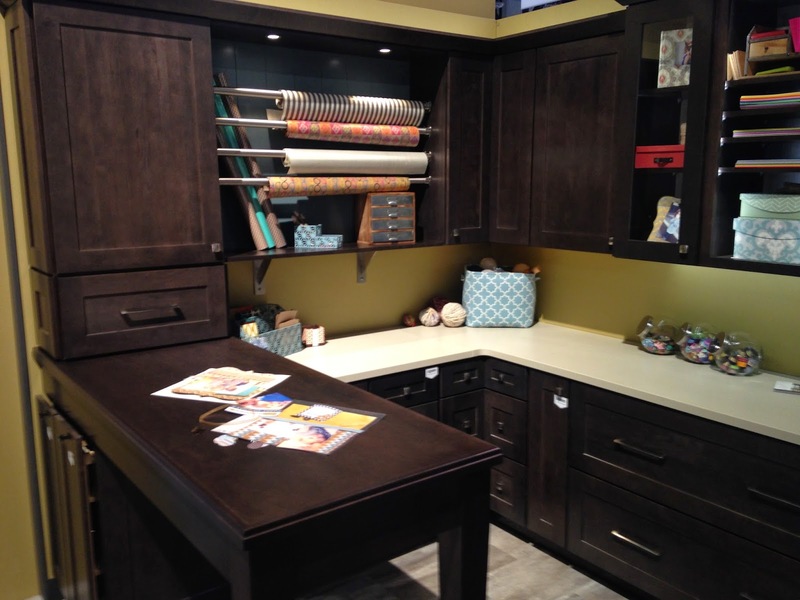 This is a crafting center set up to make any project easy, from gift wrapping to crafting, homework to home decor. It takes home projects to the next level. With good lighting this is the ultimate place to do your crafting. What do you think? I would love to hear any ideas on how to fine tune this to be the best crafting center ever. Give me a hand to design your favorite spot in the house! 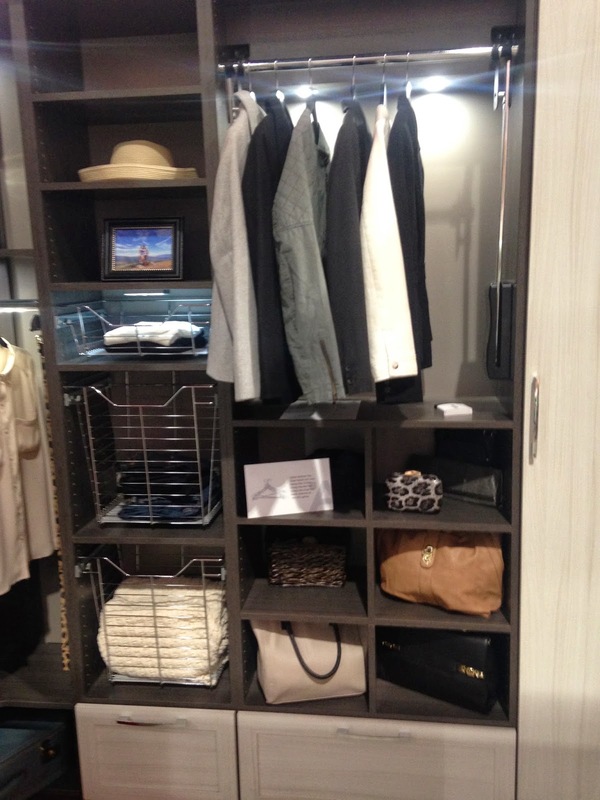 Closet Ideas to Increase your storage with plenty of room for shoes, jewelry and clothing! 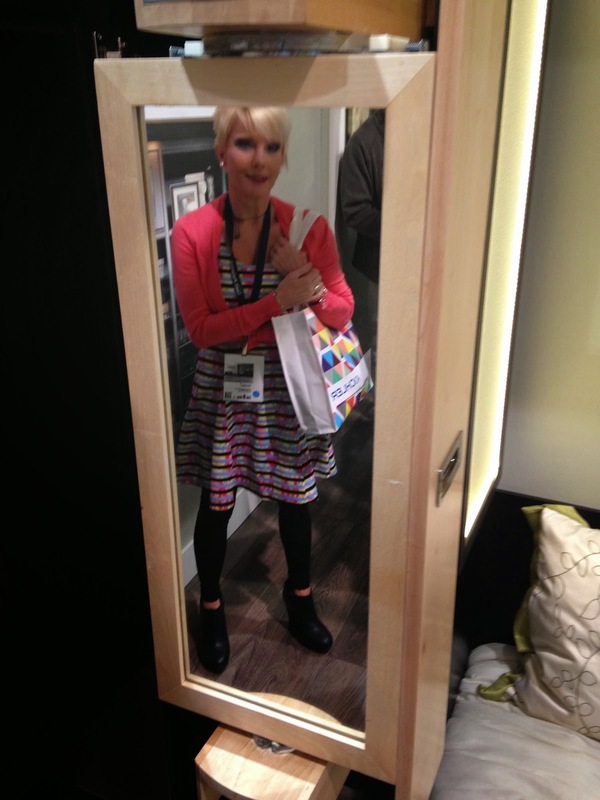 As I wandered the International Builders Show in Las Vegas Nevada one thing I noticed a lot of were systems for closets. There are hundreds of different new ideas with solutions to increase your closet storage. 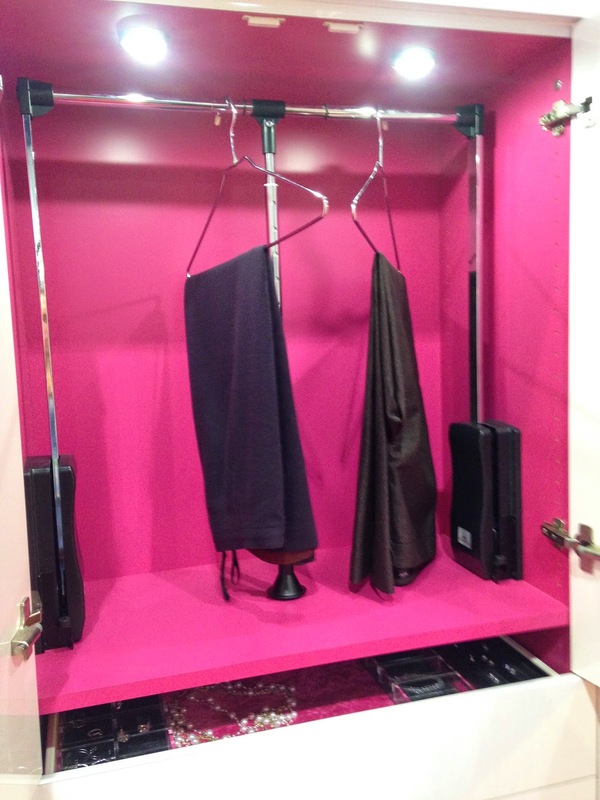 Most are pre-fab closet storage systems from companies like Closetmaid, but many are system parts that allow you to design your own built-in systems. I took some photos of ones that really looked good to me and took notes on the great new ways to increase usability of the space you already have. I am pretty excited to build some new closets. I know for ladies it's important to not only have plenty of room for your clothes and shoes, but also to have that closet have style and visual appeal as well. 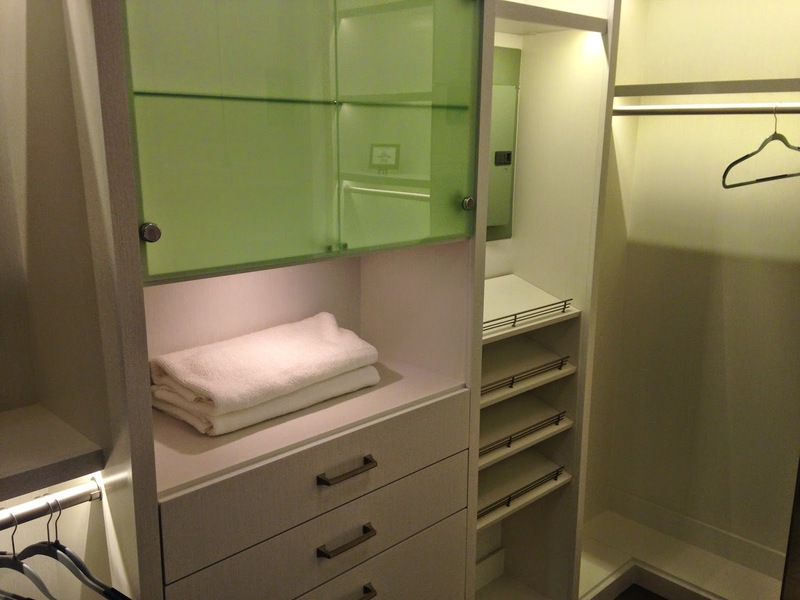 The first closet is made using Rev-a-shelf components in a very sleek modern white cabinetry with pink interior. 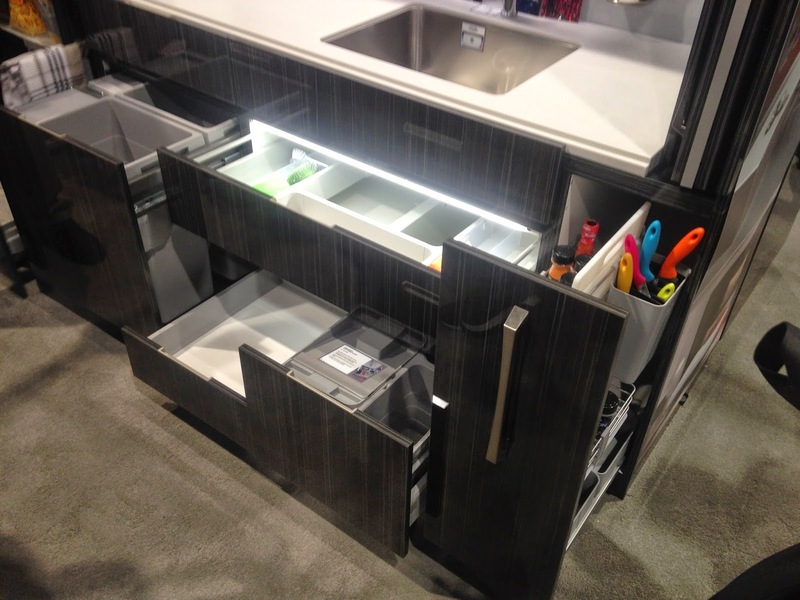 It is designed for areas without closets and offers a ton of storage for rooms that have wall space for cabinetry. 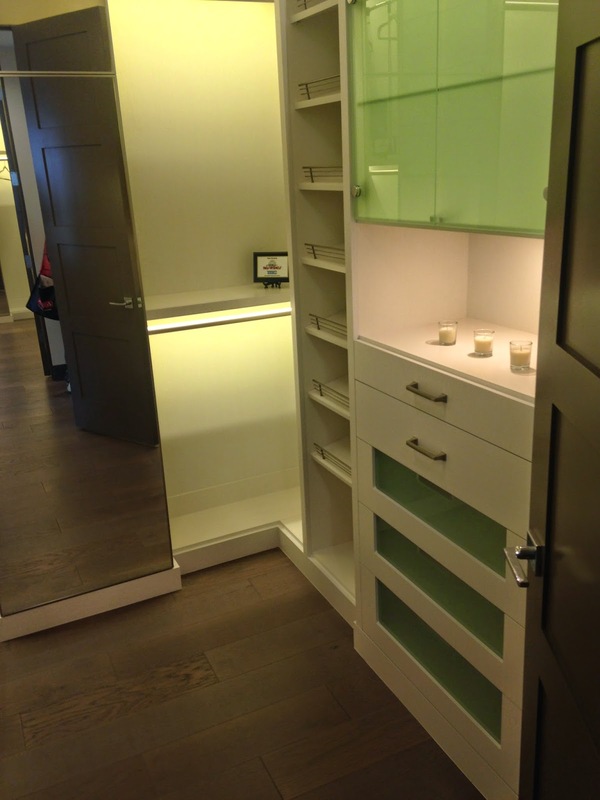 Every part of this closet system is fold away, leaving a sleek wall of white doors when closed. With a pull out mirror, a rotating corner shoe rack and pull out clothes racks its a great organizational system for a tight space. The next two videos show very cool decorative storage for ladies shoes. Both rotate to increase ease of access and beautifully showcase some of your prize possessions. 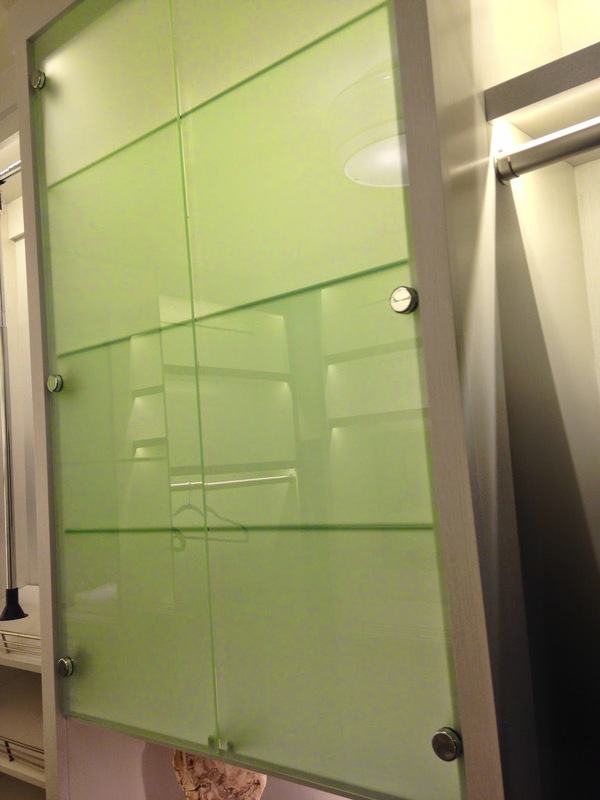 I love creative use of space that add an element of luxury to a closet. 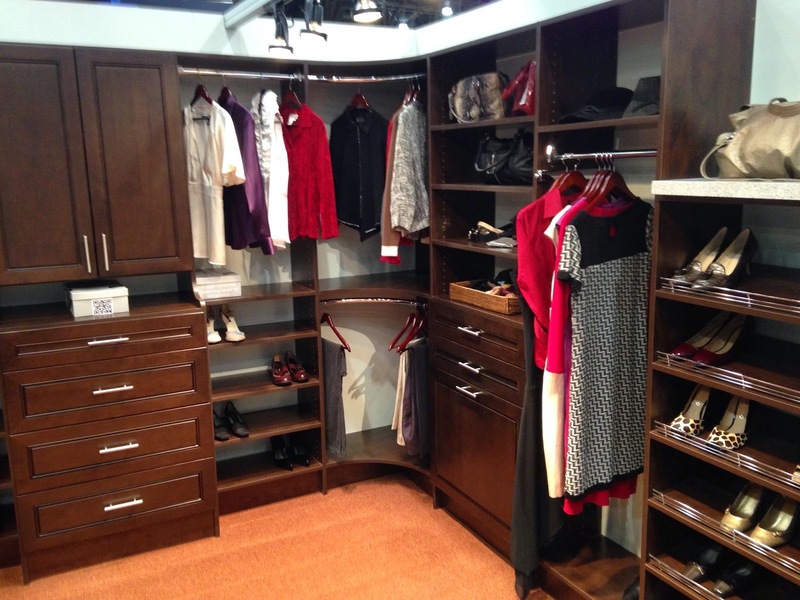 From the New American Home, here are a few shots of the master closets. Clean and modern with white cabinetry, chrome hardware, and glass doors, it is very sleek in design. 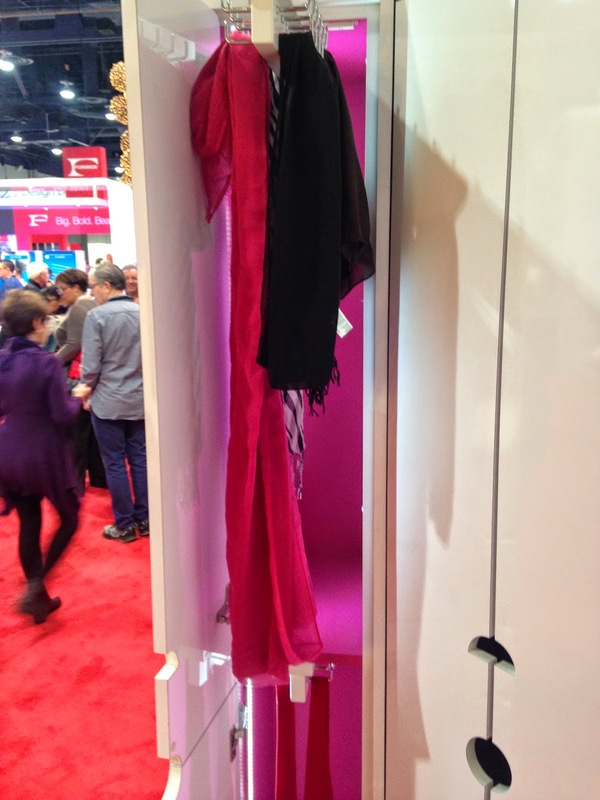 It offers tons of storage and visual access to almost all of your clothing and accessories. One thing that I've noticed is that many off the closets take advantage of creative lighting thru LED lighting, each area can have its own lighting to highlight your favorite clothes. It takes extra work to design it but I think its well worth it. 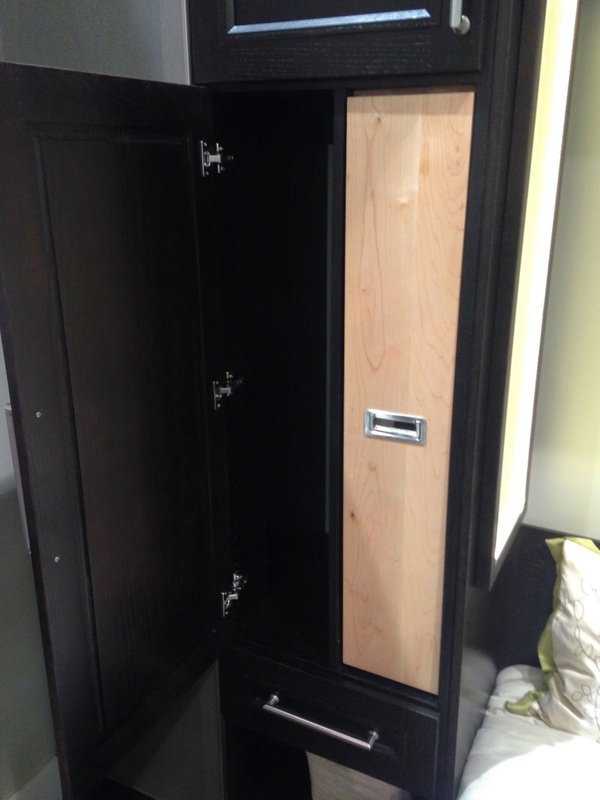 sorry about the quality of the photos, the closets are in an actual home built for the Builders show. The New American Home showcases the best in the world of homes and decor. 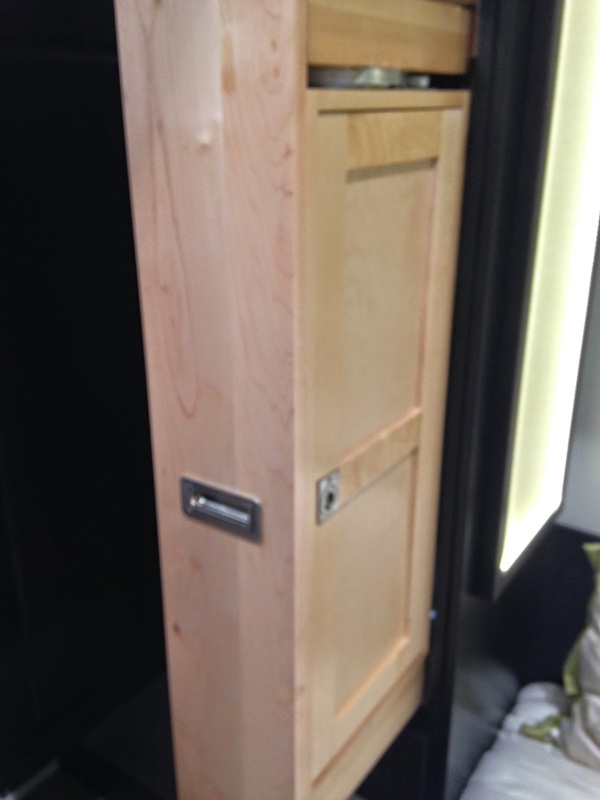 WellBorn cabinetry has a great little addition to closet storage that I really liked, it is a pull-out jewelry and accessory unit that is in a small cabinet. 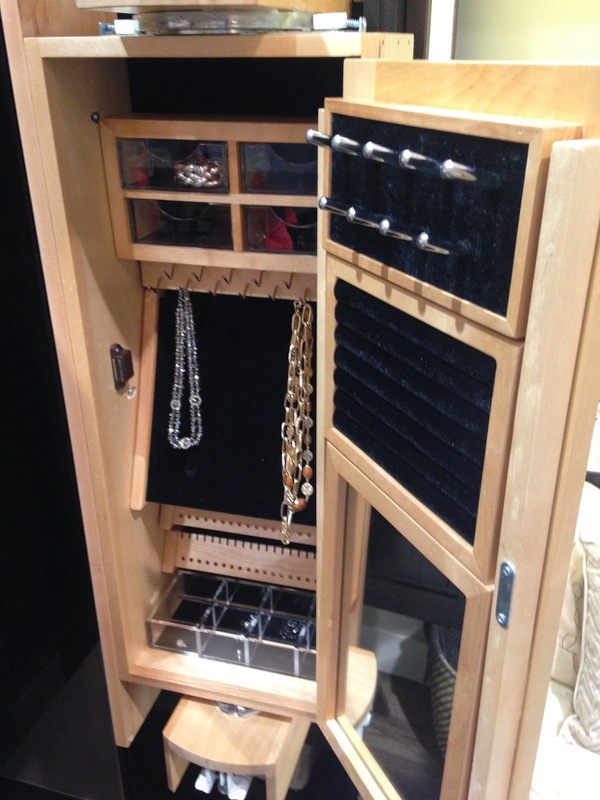 Lots of showcase quality jewelry storage and a great mirror pull out that rotates to make it super easy to use. And lastly here are a few systems I saw that I liked the look of. 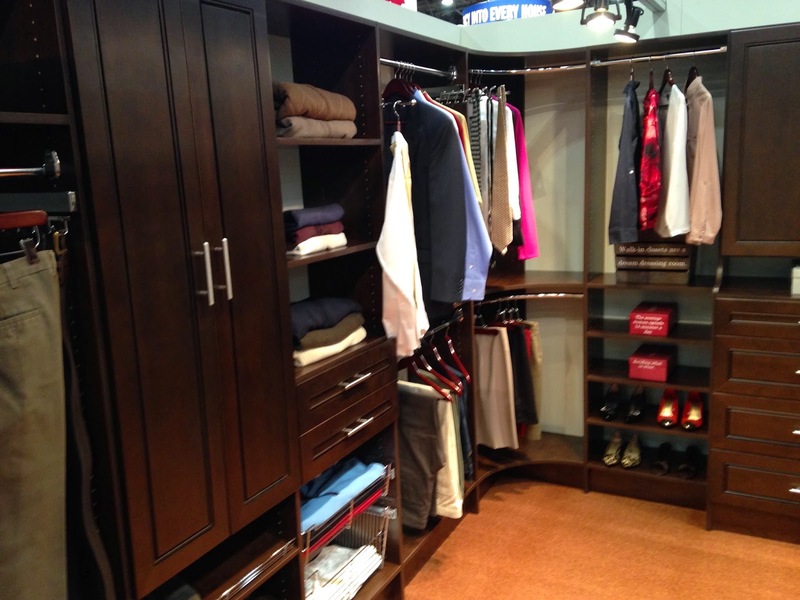 Nice clean and graceful use of closet space that helps keep you organized and neat. There is something about these closets that makes me want to keep them next and orderly. It allows you to take a room thats usually hidden away in your house because its a mess, and transforms it into a showpiece. A laundry center can make your chores at home so much easier and dare I say it, enjoyable. 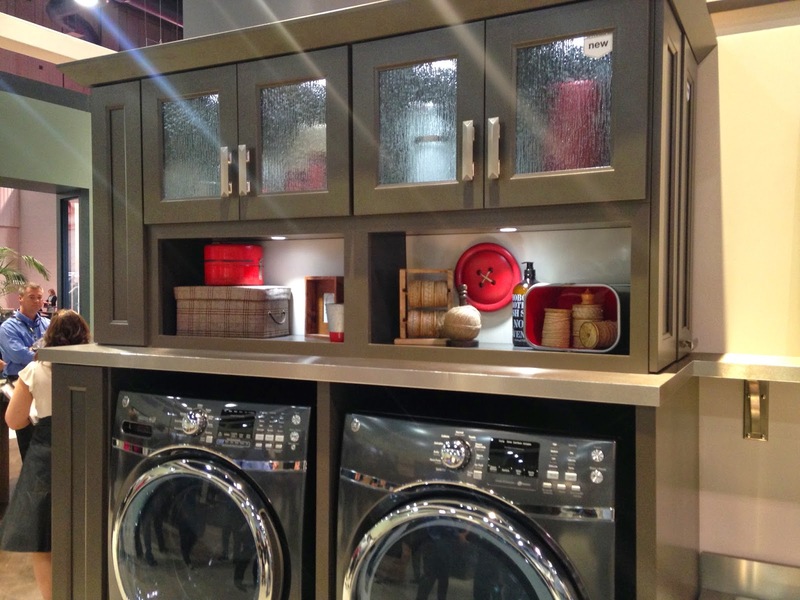 Many people who are renovating their home are now deciding to take the laundry out of the basement or back hall and make it a focal point of the home. Laundry as a chore doesn't seem so bad when you have beautiful cabinetry and a great work space for folding and hanging. 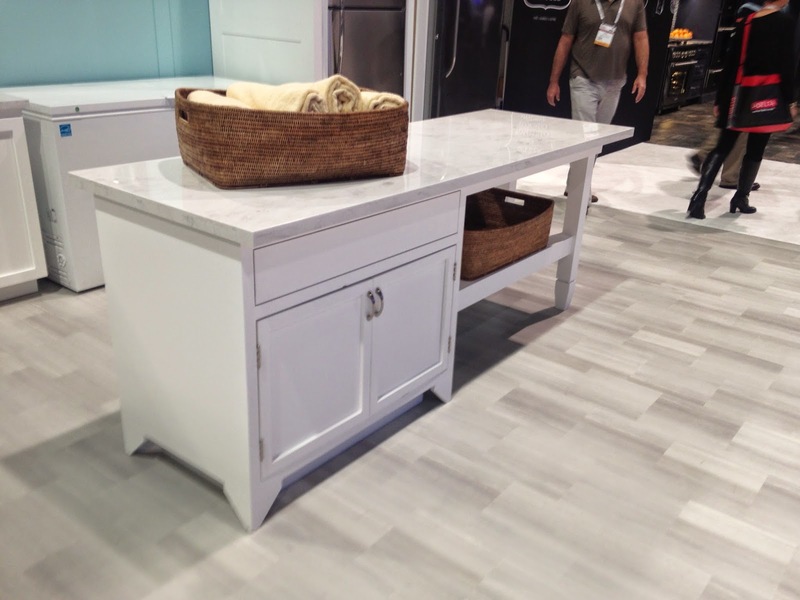 These are a few options presented at the 2015 International Builders Show in Las Vegas. 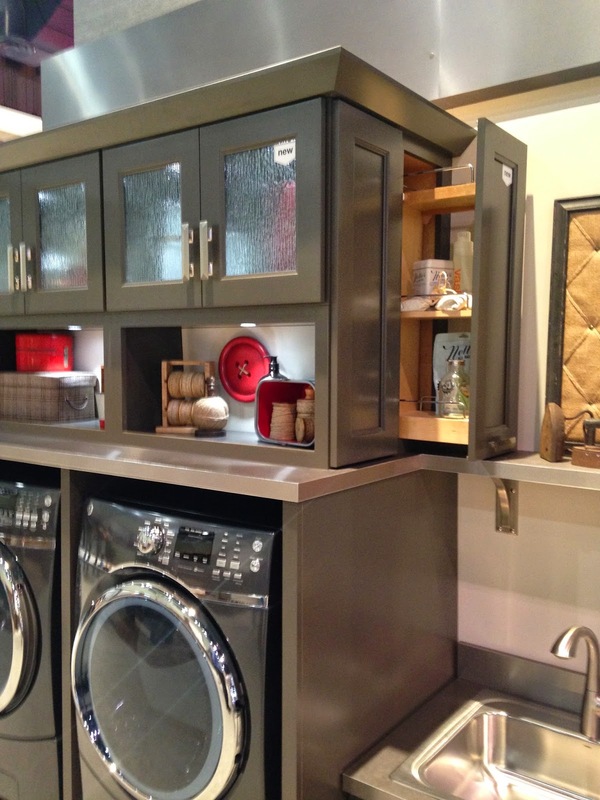 This was my favorite built-in laundry center using cabinetry from Wellborn Cabinets, they used the cabinets to design a space that maximizes usable space and work areas. Raising the washer and dryer off the ground makes them much more accessible to change loads from one to the other. 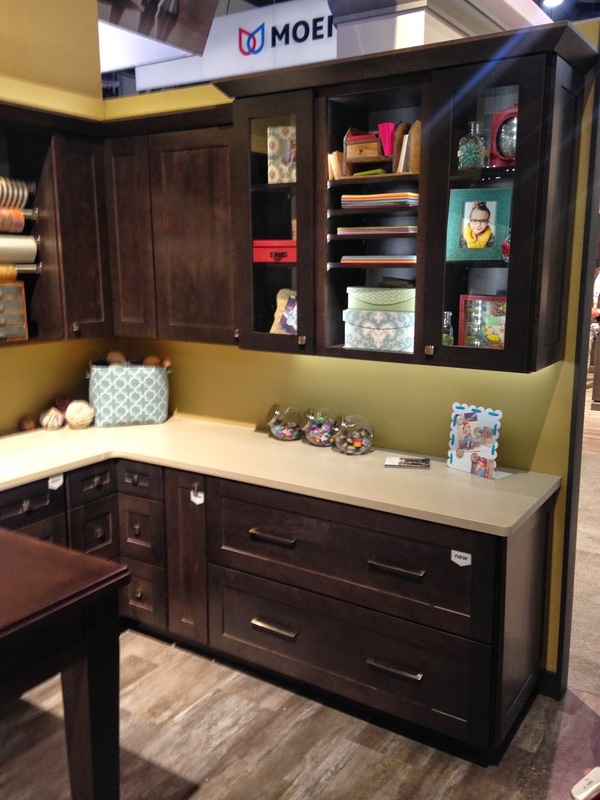 The glass front doors on the upper cabinets and the lighted storage nook add a real touch of class to the design. 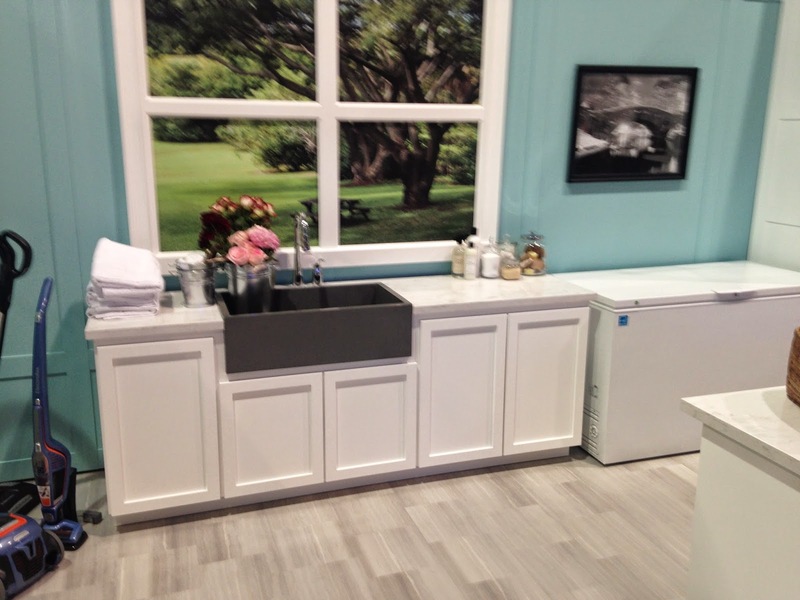 The laundry center's slop sink makes stain removal and clean-up easy with a large sink. 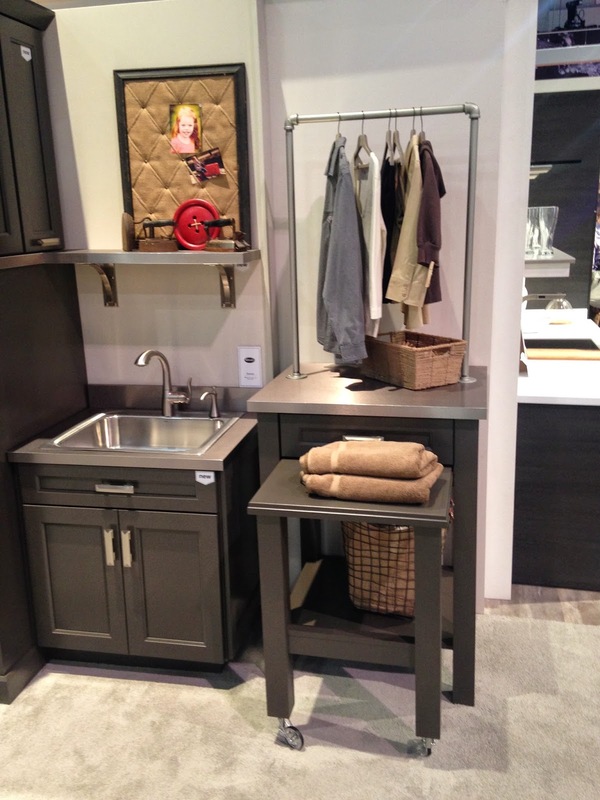 The coordinating cabinetry throughout really gives it a cohesive look, and the grey paint adds to the stylish look. One other feature that helps it to stand out is the use of red in the decor, it coordinates well and warms up the grey. The folding table creatively uses galvanized pipe to make a hanging rack on the rear of the table, and wheels on the pull out table extension allow for using part of the walking space for those big folding jobs! Kind of makes you want to do laundry doesn't it? I know, weird feeling, huh? I can't wait to apply this to the new homes I build. It really takes a horrible chore and makes it pleasant. 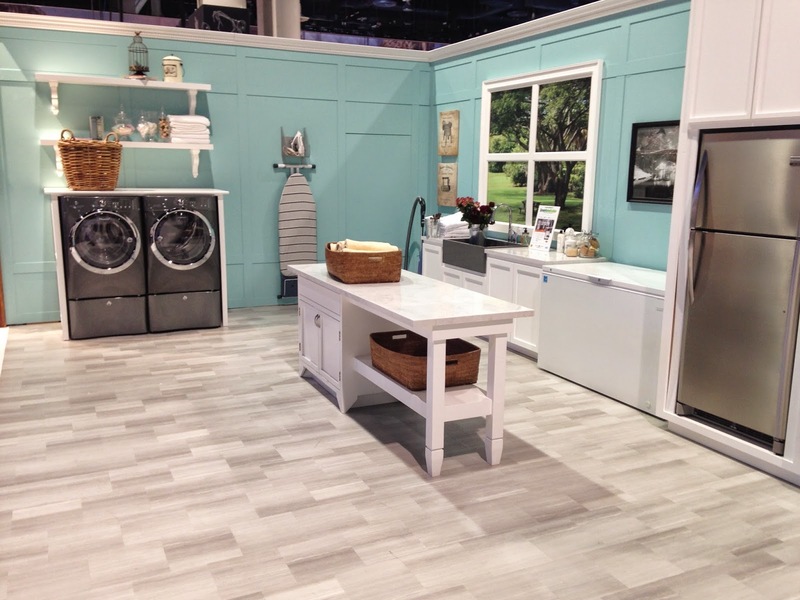 Electrolux appliances had a great display as well, the pale blue walls and the white cabinetry fit well with the grey washer and dryer. 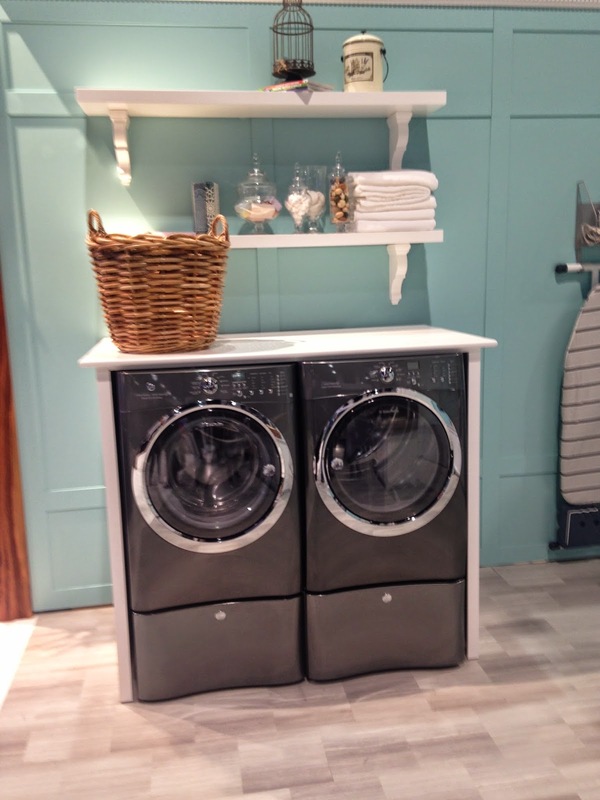 Adding a pale grey floor and paneled look to the walls adds to the cottage look of this laundry center. 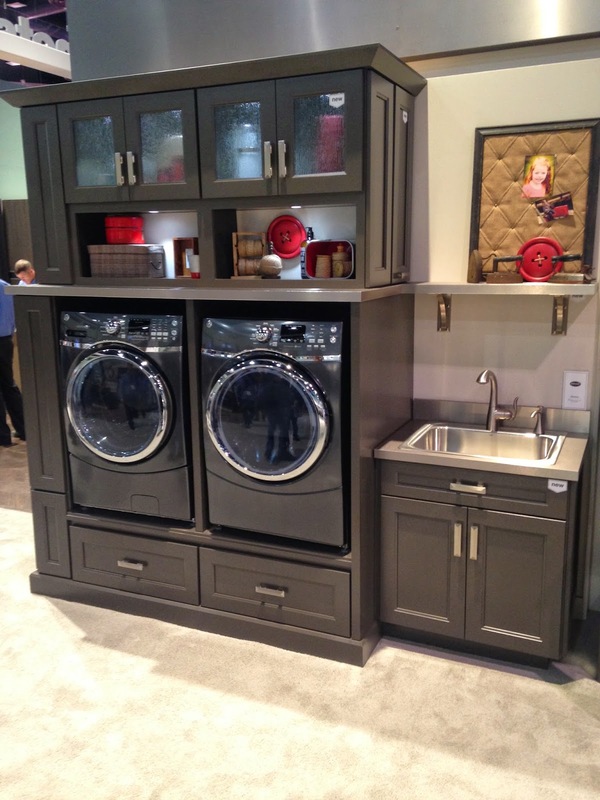 I feel that this type of laundry room would work well in a situation where the laundry can not be brought into the home its self, for instance if the basement is the only space to put the washer and dryer. Adding a wall treatment to an unfinished basement is not difficult, and the light color will brighten the space when combined with the white shelving and island area. Combining this space with a freezer and or extra refrigerator in the basement helps makes a combined use area that takes less space than two separate areas. With homes shrinking in size creating usable space is critically important, combining uses and adding light and bright colors make it a happy warm feeling space to work. I hope this little view into the new ideas helps you to create a warm happy place to do your laundry. This is one of many posts coming as I bring you a view into the 2015 International Builders Show. Subscribe to my blog and keep watching for new posts! As always, remember to come get your BuilderFix! I want to help you finish all those little projects around your house! If you have any questions or comments please feel free to leave a comment below, and I will get back to you with an answer! A kitchen for a small home. Simulated flat panel wall treatments! 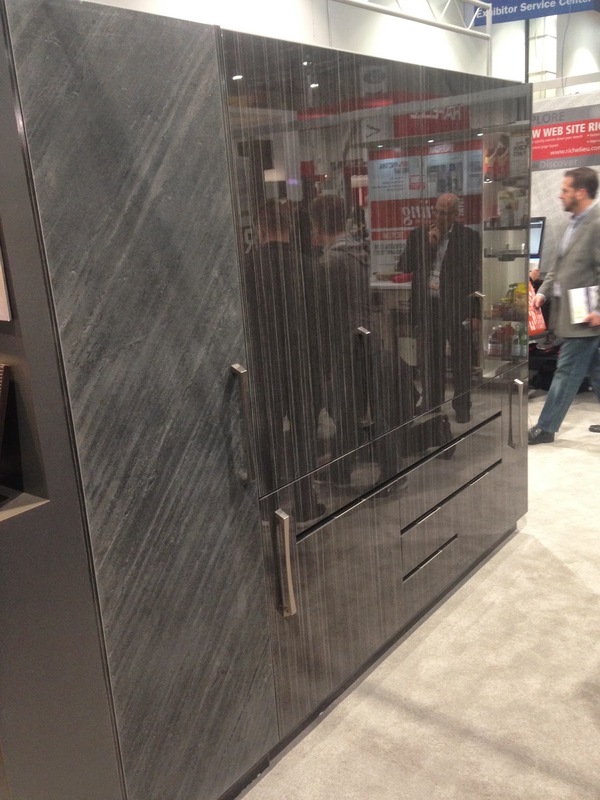 A new exciting apron front sink From Kohler. Finding a Stud in a wall. Welcome to the Builder Fix!